Dialectical Behaviour Therapy (DBT) is an intensive out-patient therapy developed by Marsha Linehan to treat chronically suicidal clients diagnosed with Borderline Personality Disorder. DBT has also been adapted to treat clients with addictions, eating disorders and other complex problems. Working with clients who experience these difficulties is extremely challenging for mental health and direct service professionals. DBT has proven to be effective in reducing suicidal, self-harm and other impulsive behaviours and to increase client engagement in therapy. DBT blends Cognitive Behavioural Therapy with acceptance-based strategies stemming from Zen philosophy. A primary therapeutic task is to balance acceptance of the client with a focus on change. 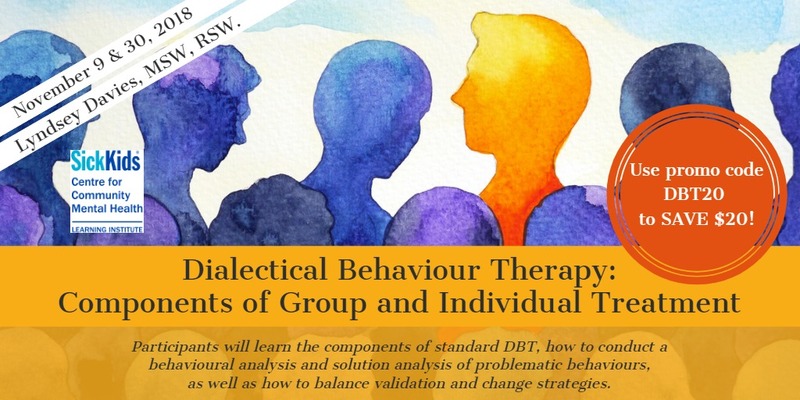 During this workshop, participants will learn the theoretical underpinnings of DBT, the group and individual components and DBT skills from each of the four modules.